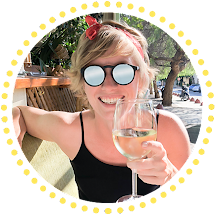 The Blonde Local: Meet the Quokka! I am here today to introduce you to the quokka! No idea whether quokka is a noun, verb or adjective? You're not alone. I only discovered what a quokka is a few months back when Red told me I absolutely had to hunt down the little animals while I was in Australia. The quokka is an incredibly cute, little nocturnal marsupial that is found only in the southwest region of Western Australia. 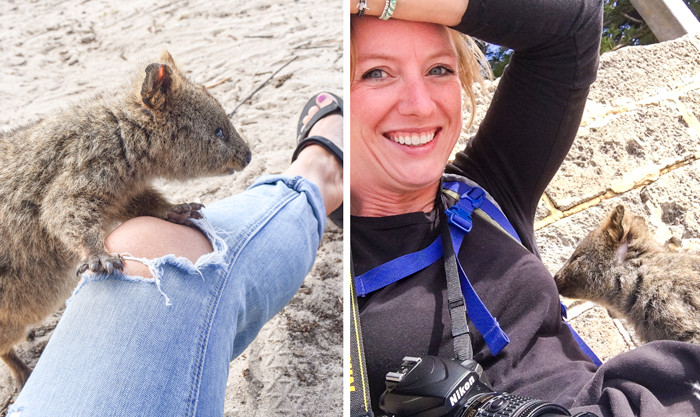 It's gained social media fame over the past few years due to a few fabulous #quokkaselfie posts, and now everyone wants a pic. 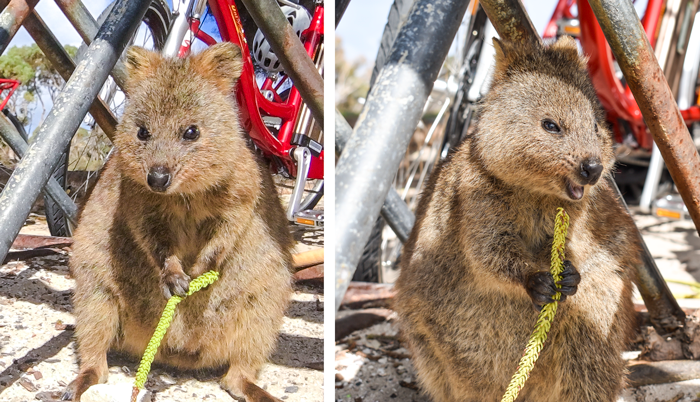 Quokkas look like a cross between a wallaby and a rat... a cute rat though. 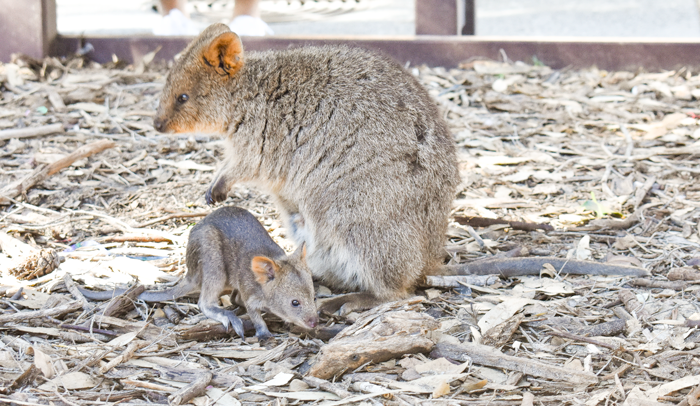 The easiest place to find quokkas, where you'll actively have to work to avoid them, is on Rottnest Island about 12km off the coast of Perth in Western Australia. The island's name is derived from rattennest, which in Dutch means rat nest. The early explorer Willem de Vlamingh rudely mistook the cute little buggers as large rats. Apparently, the name stuck. Ahh a joey! This bub was full of energy and was running and jumping all over. Way too cute to be a rat. The animals have very little fear towards humans, so if they're curious enough they'll walk right up to you. In most cases, they'll also let you walk right up to them. This is why people have been able to get so many great photos because they don't scamper away when you stick a camera in their face - not that I am condoning that method. 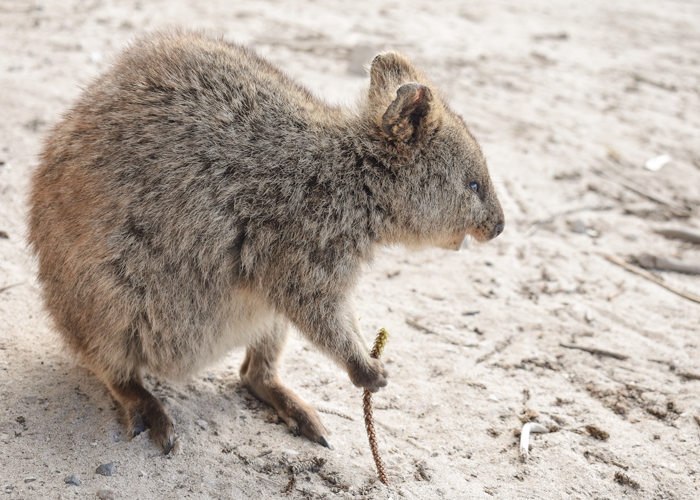 I was torn while visiting Rottnest because the quokkas are everywhere (I nearly hit one with my bike when it ran in front of me!) and it's apparent they're unfazed by humans on the island. But even though they're friendly I believe they should still live like wild animals. So in order to get my close up photos of the animals, I let them approach me. I wasn't going to jump down beside them and stick my camera in front of them - I don't want to be the cause if one time they get spooked. So I sat on the ground around where a few of them were eating and within five minutes one had walked up to sniff me out and tried to climb over my leg. Of course, I was thrilled to be up close and personal! But I felt even better that I hadn't bombarded his personal space. Yes, I will play with you!